Net Japan presents the one-of-a-kind waterproof Juke Tower MP3 Speaker for bathroom and outdoor use. Extremely versatile Juke Tower is completely waterproof so you can listen to your favorite tunes even in showers. Onboard stylish embedded LED clock as well as track display. Operate directly and easily through the top menu panel. The glossy, Juke Tower sports an all-white design, with a large 2GB storage for up to 12 hours of playback time using only 3 AA batteries. Detachable USB drive allows user to drag-and-drop music from either PC or Mac (and leave the Juke Tower in your bathroom). 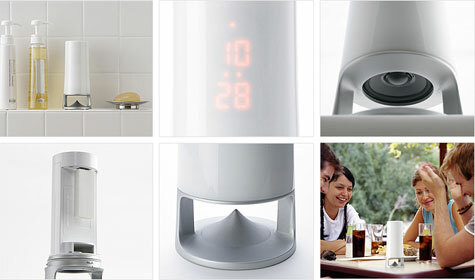 High quality sound through its omni-directional speaker, a great idea for bathroom, kitchen, and outdoors. A stylish interior design item. First available from AudioCubes.com! Power-packed towers could be the alternative name of these speakers. And 12 hours of playback time is amazing.